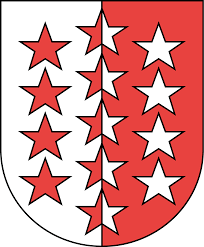 The well-known summits of Fletschhorn (3993m), Lagginhorn (4010m) and Weissmies (4017m) are popular with tourists and mountaineers in the Swiss alps. The mountain ridge separates the Saas valley from the Simplon valley in the canton of Valais close to the Italian border. 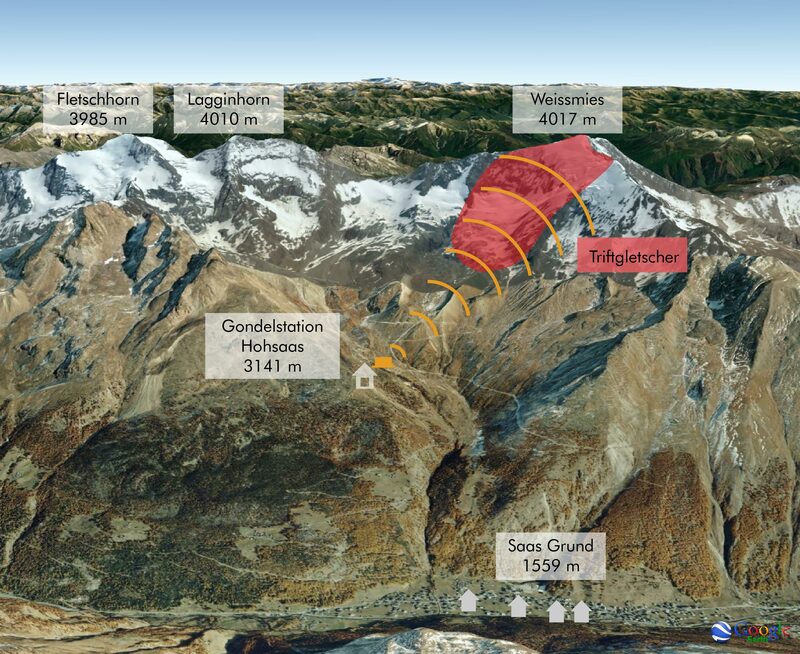 Saas Grund, a tourist resort, is located at the foot of the mountains with the ski field Hohsaas above facing the Trift glacier in the northeast face of Weissmies (see map below). 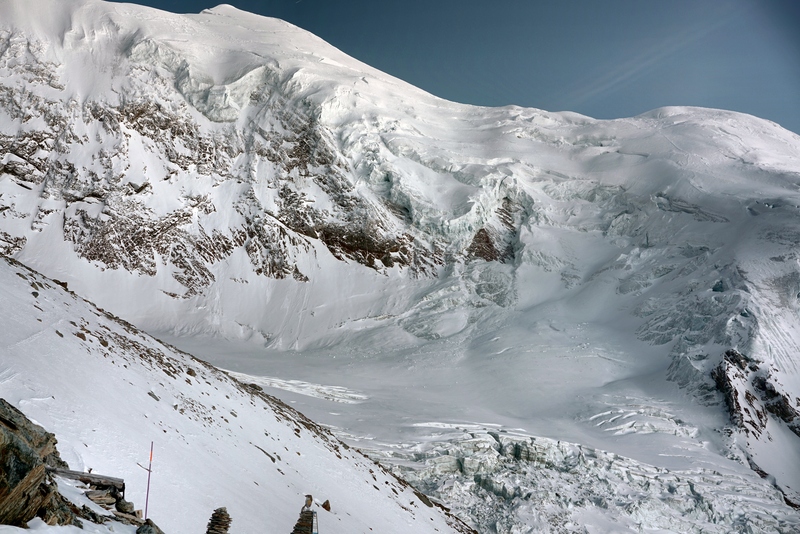 In summer 2014, an increase in ice avalanche activity was reported (reports: alpine safety). 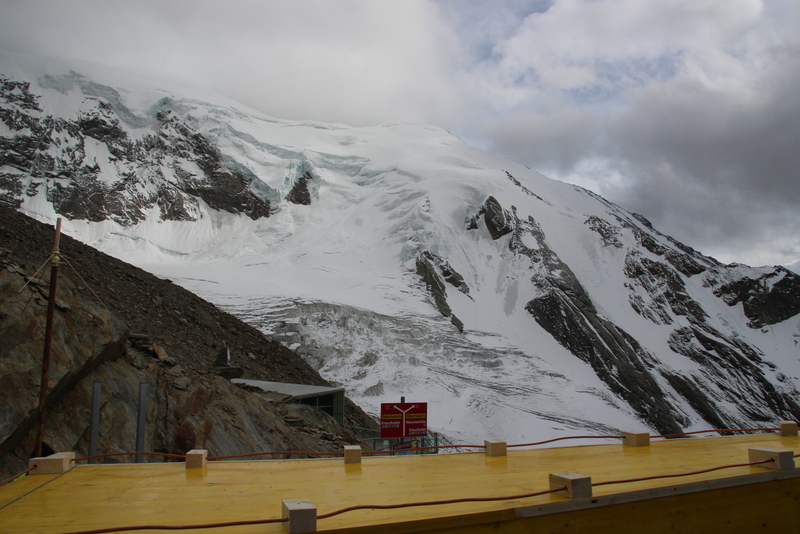 Due to the glacier mass loss predominating the steeper areas (see this comparison), the hanging glacier that was formerly supported by ice from below had destabilized. 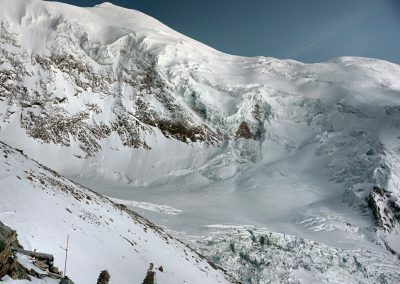 As a consequence, a large part of the glacier was in danger to collapse with potential impacts in the valley below and Saas Grund, depending on the collapse manner. Our interferometric radar is a reliable technique for short or long-term monitoring of movements of this kind, regardless of visibility and weather conditions. The radar is able to measure spatially resolved deformation rates with high accuracy. 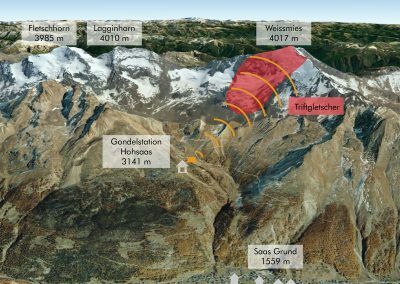 The top station of the chair lift at Hohsaas was identified as ideal location to monitor the unstable glacier area of the Trift glacier. Given the high elevation of 3141 m, this station presents a challenge in terms of system requirements and atmospheric correction. Since installation in 2014, the radar has provided one measurement an hour in good atmospheric conditions. However, heavy snowfall or wind can interfere with radar measurements and lead to short data gaps. In 2.5 years of continuous radar operation, high quality data was available at 95% of all days. During this time period, several harmless ice avalanches were detected a few days in advance. 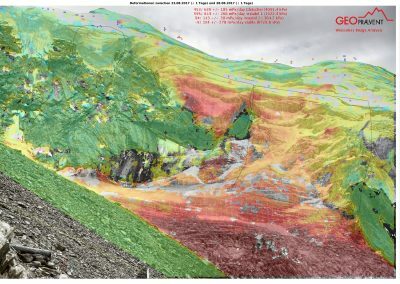 Interpretation of glacier movements and deformation analysis is performed by Prof. Martin Funk from VAW/ETH Zurich and the office wasser/schnee/lawinen in Brig, Valais. Here is an example of an ice avalanche in 2014. The movements of the unstable glacier area decreased continuously from initially 20 cm/day in 2014 to 5 cm/day in late 2016. 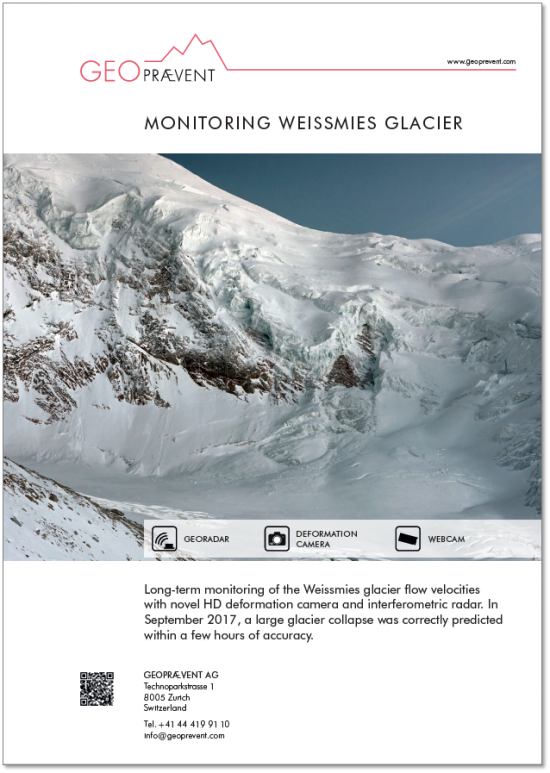 Therefore, we tested different means for long-term monitoring of the glacier and installed a HD-camera for automatic deformation analysis alongside the radar in winter 2017. The HD-camera provided excellent results and proved as cost-effective alternative to the radar measurements – in case weather is not an issue. Additionally, the deformation analysis by HD-camera acted as independent validation of radar data on days of good weather and visibility. After the test camera test period, we dismantled the radar and the HD-camera assumed monitoring solely from spring 2017 onward. 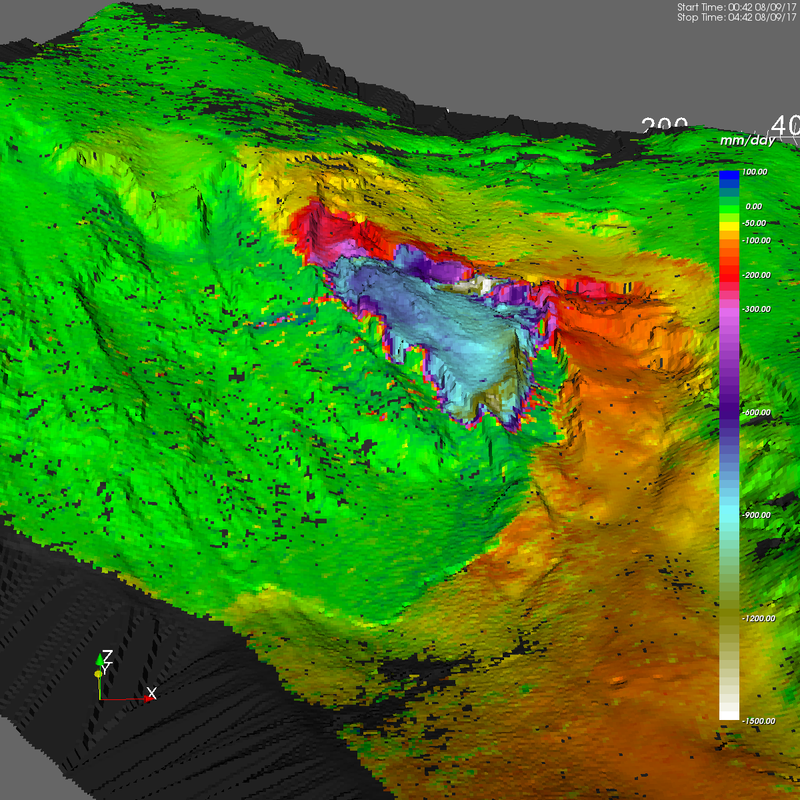 Only a few months later, the deformation analysis of the HD-camera showed strongly increasing flow rates of the unstable glacier area. Hence, the interferometric radar was reinstalled on 7 September at the previous location. The radar measurements confirmed the acceleration and provided data on an hourly basis despite the prevailing bad weather. Whereas the initial flow rate was ca. 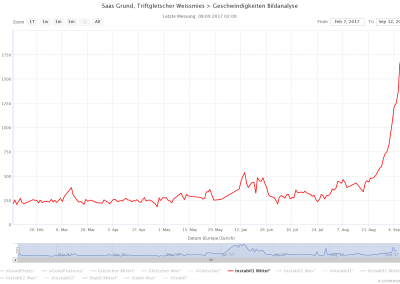 80 cm/day, it exceeded 2 m/day only two days later on 9 September. 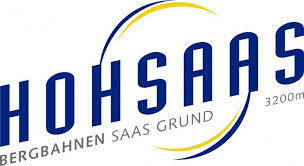 Considering that a singular collapse of the unstable area could impact the village of Saas Grund, it was decided by the local authorities to evacuate the village part at risk in the afternoon of 9 September. 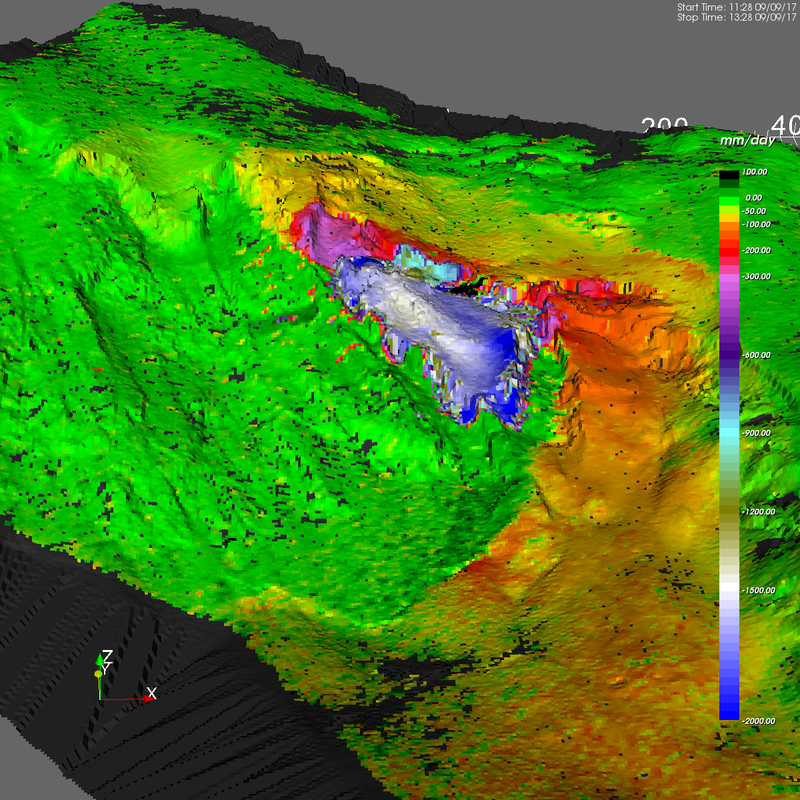 Based on the radar data and their vast experience, the expert group including Prof. Martin Funk od VAW/ETH Zurich and wasser/schnee/lawinen in Brig, estimated the date and time of the expected collapse to the following morning (10 September). 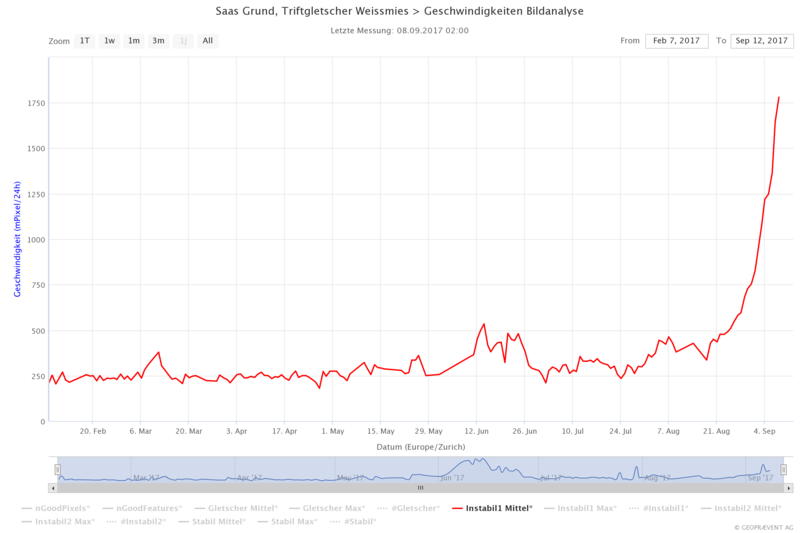 Throughout the night, the unstable glacier area continued to accelerate and eventually reached 3.5 m/day before breaking off in several events between 5:30 Am and 6:00 AM. The ice masses landed in multiple ice avalanches on the glacier below without causing any consequences further down the valley. 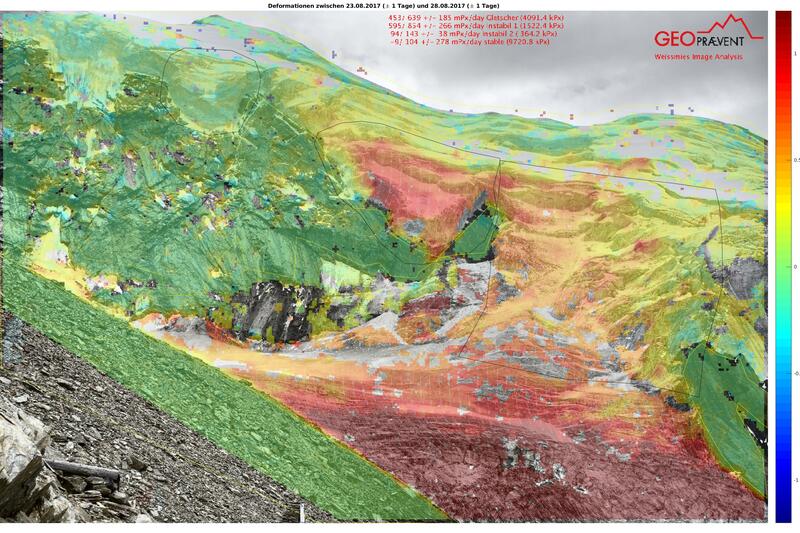 Monitoring of the remaining unstable glacier areas by radar continued for another month. Several smaller events occurred during this time which were all clearly visible in the radar data a few days in advance. 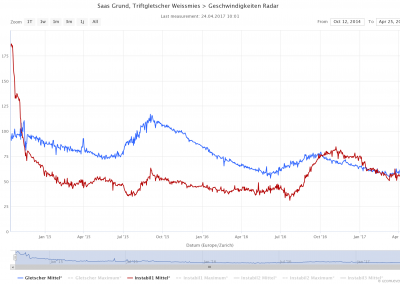 Since October 2017, monitoring is again exclusively performed by HD-camera. Area map with Sass Grund, Weissmies ad the Trift glacier. Radar and installation material are directly delivered to the measurement site by helicopter. 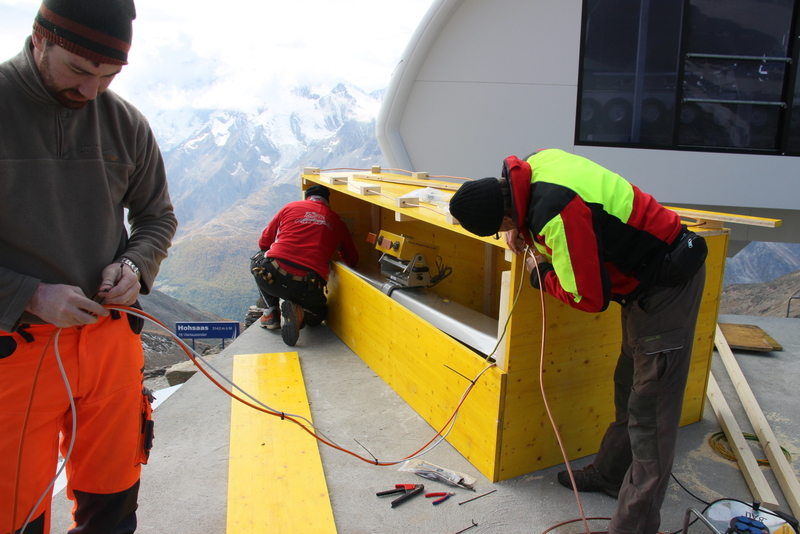 The instruments are mounted on the roof of the chair lift Hohsaas. 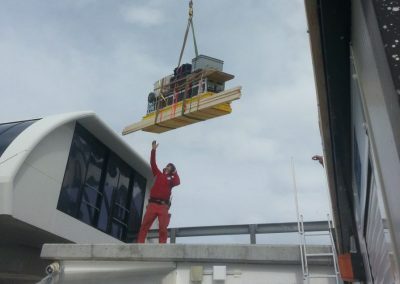 Radar and protective cover were installed within a day with the active support of the local authorities and the lift provider. Radar view in direction of Weissmies. On the left hand side is the “unstable triangle”. Always up to date: Development of glacier flow velocities in red for the unstable area (maximum and average) as well as for the rest of the glacier in blue. 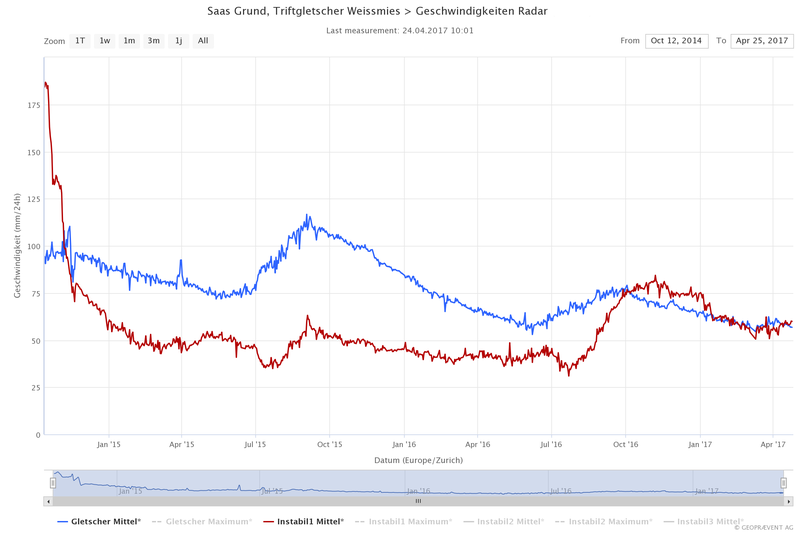 The data covers the entire time period since installation in October 2014. The novel high-definition camera provides pictures with remarkable detail of a large area even from great distance. 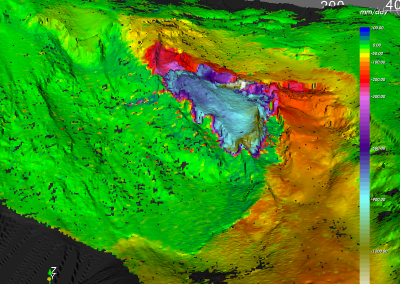 Glacier surface deformation measured by the camera image analysis. 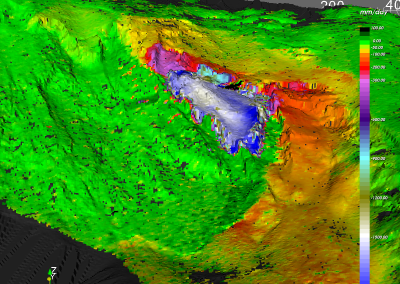 Acceleration of the glacier as measured by the camera image analysis.